Trying to figure out what to do during fall or spring break, or want to spend a few weeks learning the language where it's spoken? Join EESA’s intensive language program for one, two, or as many weeks as you wish. Courses combine formal classroom instruction with a variety of social and cultural activities. This allows students to observe, discuss, and participate in Ukrainian culture and to practice language skills and themes developed in class. The program includes 24 hours (1.5 credits of Russian or Ukrainian language) of instruction for the week. Outside of classroom, EESA’s on-site staff organizes a lot of activities that will allow you to continue speaking Russian or Ukrainian with other local students, friends and host families. With EESA's full immersion language program, you will be able to improve your language proficiency over a short period of time. Students will live with host families while participating in EESA's short term intensive language program in Kharkiv, Ukraine. This gives students the great opportunity to practice their language and learn more about Ukrainian customs and culture. Some placements in student apartments may also be available. Students will have an orientation upon arrival to Kharkiv, Ukraine. 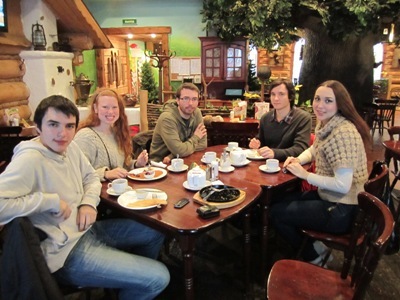 You will learn about the city, the university and meet local students from the first days abroad. Students in the EESA community receive strong pre-departure and on-site support. Every student is assigned an advisor who will guide you through the application process and work closely with your university to ensure that all the correct steps are taken to prepare for a successful and safe study abroad experience. When you arrive, you will be greeted by an EESA representative at the airport or train station. EESA’s friendly and knowledgeable on-site staff provide full support to students 24/7 and are always willing to help out in any way possible.